Richard Quin, Lead Portfolio manager of Bentham Asset Management, is one of Australia’s most seasoned and successful credit investors. While the asset class remains overlooked and underrepresented in many Australian portfolios, there are two bets he’s making right now that should grab your attention. The first position is that long-term interest rates in the US are about to start rising - and rising quickly. The second position is underweight Australia, where Quin believes a recession is overdue. The issue for local investors, according to Quin, is that few people are fully aware of just how exposed their portfolios are to both of these scenarios. In this exclusive interview he explains how he has formed these views, where he wants to be invested and the types of assets he is avoiding. Interestingly, in the 26 years since Australia introduced compulsory super, global government bonds have delivered better returns than global equities (unhedged) with much lower risk. While credit is largely attributed for setting off the GFC the reality is that while equity indices took four and a half years to recoup losses, credit rebounded in just one and half years. You're in an elevator with someone that doesn't understand investing in credit, but they're interested to know more. You've got a 30 second pitch to convince them. What would you tell them? Okay. The pitch is, you don't have to take as much risk to get income. You can actually invest, and be diversified, and get a strong income on a monthly basis, and protect a lot of your capital through the benefits you get through investing in credit. So you can invest up the capital structure, you can be senior and secured, in a diversified portfolio that makes sense on a risk-adjusted basis over time. There are other alternatives rather than just, say, putting it all on a long bet in equities, which can be quite risky, and you can lose money, and be down without getting income. Or taking just a long duration bet in traditional fixed income that you don't know you're taking, which I think is the problem right now. There are a lot of people with portfolios that are taking a long duration bet, they just don't know the bets they're taking. What is a good environment for investing in credit? We would see ourselves as a credit investor that looks at all sorts of credit, all around the world. We don't limit ourselves. So we can invest in corporate credit, we can invest in structured credit, asset-backed securities, emerging market debt and things like that. Generally speaking, we like environments where people are worried because that tends to keep the credit spreads wide. It's best when they're worried and concerned and nothing occurs, but when events occur, we usually find that it provides opportunities for us. When we do invest, we're always looking at the downside. We're always looking to how to mitigate risk in a position, so we can protect our downside. So an ideal scenario for a credit investor is when there are wide credit spreads, and the opportunity for de-leveraging (eg. Borrower repaying debt early or raising equity). We've recently seen that type of environment in Europe, where people were really worried, but Europe was fundamentally improving. You know, that's an environment that's quite good for credit. So let's flip it on its head, what makes you nervous? What makes me nervous is when you have people investing with optimism, when they invest for hope. When you're a credit investor, you have to be more sceptical, and you're definitely looking to try and protect your capital while balancing this against the aim of an attractive long-term investment. We try to imagine the worst-case scenario, and how we're placed in that situation. How do we get our money back? How much protection have we got in our portfolio? I actually do look at equity as a cushion in my portfolio. It's a cushion, because if the market should fall, equity sits below credit in the capital structure. So that cushion protects us. When there's a lot of cushion, that obviously gives us some protection, and we quite like that. Generally speaking, we don't like to look at companies that have a huge amount of growth. Something that's got a lot of growth can obviously see the opposite, and if you're a credit investor, you're not being rewarded for that growth. An equity investor may be rewarded for that growth, and usually is looking for that growth. I think equity investors can be overly optimistic towards growth, whereas we sort of get grounded in just getting the returns that come through. Generally speaking, for credit, recessionary environments are bad. So recessionary environments are where you can see big changes in earnings for companies, and you start to see events of default occur. Now, part of the reason we have less of our weight towards Australia, right now, is we think Australia is overdue for a recession. Now, it might not happen next year, or the year after, or the year after, but eventually, the business cycle will be re-enacted in Australia, and we think, because we've had a long period without having that sort of cycle, that it may bring with it a bit of a Minsky moment for Australian investments. Now, I don't really want to see that, but because we have the alternative of investing in the areas that have already been hurt, that are recovering now, we'd rather be there. Should there be problems in Australia, we're more than willing to bring some money back and help out, at some decent yields. While talking about the ‘R’ word, inverted yield curves are seen as a harbinger of recessions. What’s your interpretation of the yield curve at the moment, and why is it important? Basically, the yield curve is just the short-term rate, versus the long-term rate. So when the short-term rate is higher than the long-term rate, that's what we would call ‘inverted’. We're not actually inverted yet. 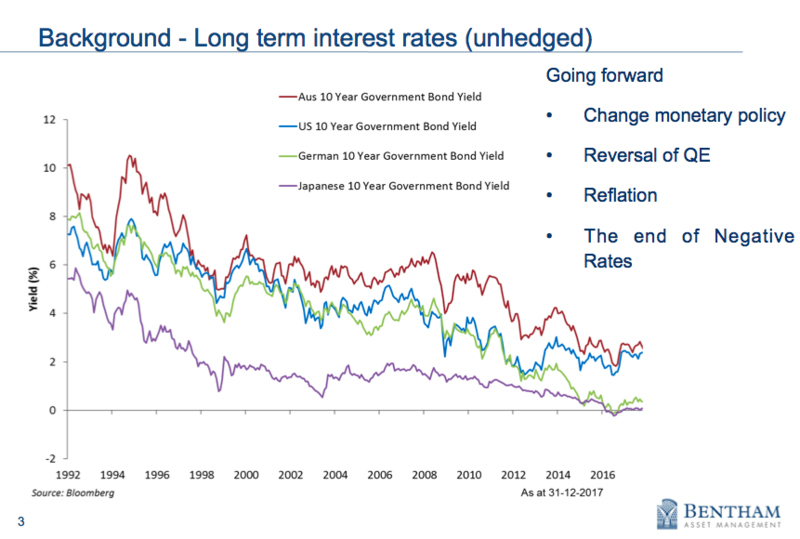 We've got a reasonably flat yield curve, the same as in the United States. Australia might get inverted. It's possible. Historically, an inverted yield curve has been useful indicator of a pre-lude to a recession. But I think what's happening at the moment is more complex, as central banks, globally, have manipulated the yield curve. As you see quantitative easing reversed you'll see less demand for treasuries and mortgage backed securities in the US. So on average, there'll be US$50 billion less a month being invested in that asset. So, I've got to think eventually that sees the long-term interest rates starting to rise. I do think The Fed will continue to tighten interest rates, because they can. It's not having a big effect on the US economy. To be honest, the US economy looks pretty strong. I also think supply and demand fixes most things. For example, we have less labour available in the US, because the employment rate is falling. We're starting to see the level of people quitting their jobs rise in the US. That indicates people are confident in finding new work, so I think labour will be able to bid wages up a bit. I do think that we will start to see some inflation come through. So what do I think about the current yield curve? We've been short interest rate risk, in the short part of the curve, in the US, as interest rates have been selling off (yields rising) over the last year and a half, and it's been positive for us. We've made money shorting that. What’s your view on interest rates in the US and how do you expect this to impact different asset classes? So just to be clear, the market is anticipating fewer increases in the interest rates than The Federal Reserve is currently projecting. Last year, The Federal Reserve actually delivered on their projections - ‘The Dots’. I believe they'll be much closer to their projections again this year. Because there is so much momentum in the US economy right now, you may even see more than three interest rate increases this year. Now, the market is pricing two hikes. I believe the market doesn't want to price more, because basically, it's been right not to follow Fed projections until last year. It's quite likely the market will be wrong again this year, and that we'll see more activity, and see more increases in the interest rates. It's possible The Federal Reserve could become more hawkish with the changes. So yes, we think interest rates are going up. Now, how is it going to knock on to other assets? Well, to be honest, for early increases in the interest rates, the one thing everyone's relying on is that bond markets and equity markets will be negatively correlated for changes in the interest rates. I think that's a bad bet over a longer horizon. That's a really bad bet, because early increases in interest rates don't tend to affect markets, but as you get midway through the cycle of tightening, I believe it can have a knock on effect to all assets that have fixed cash flows (including equities, property not just bonds). So I think it does have an impact on equity prices because you start to see interest rates start to increase globally. I do think rates globally increase, and that's actually a bit of an issue for Australia, because I don't think Australia is as well positioned for increasing interest rates as other countries. So where do you want to be invested? We like floating rate assets. So assets that, as interest rates go up, the yield goes up, but the capital price doesn't go down, for example floating rate notes, corporate loans, asset backed securities, things like that. So when the bank bill rate goes up, the coupon paid to investors also increases – there isn’t a fixed coupon going on into the future. There aren’t too many asset with that floating rate quality. Government bonds, equities, property, any fixed future cash flow you discount, can be hurt by rising interest rates. In actual fact, in some of our portfolios we’re taking an active position in betting that interest rates are going up, by holding a short (as in negative) interest rate duration position. We've done that for a while, and thus far, touch wood, it's working. I think those floating rate assets, as people try and preserve their capital, will be more in demand by the market when rates rise. It's usually the job of an investor to anticipate what other people will want to buy down the track. What are some of the myths around investing in credit, that you think are worth debunking? 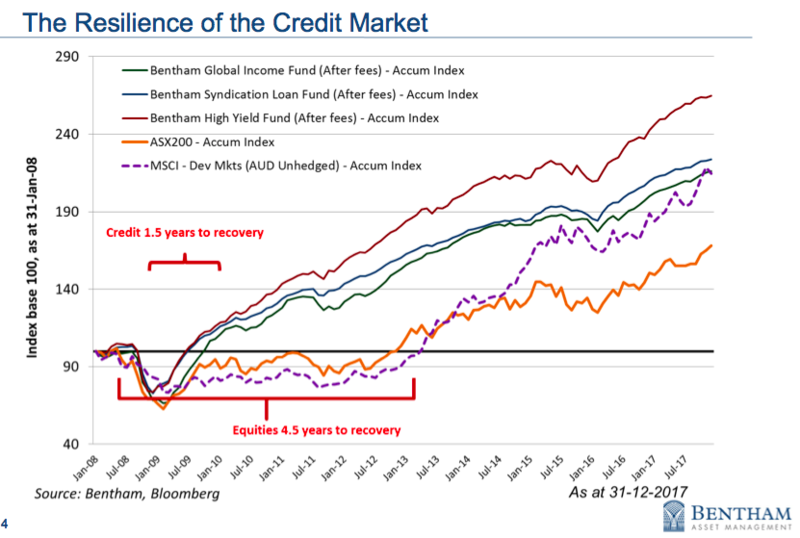 The best one, or the biggest one, I think, is; “credit is riskier than equities”. Absolute rubbish and anyone worth their salt should know it’s rubbish! To start with, looking at 20 years' returns for high yield bonds, it's had as good a return as equities with a third less volatility. It's just not as risky. The standard deviation is much lower and the downside risk is not as low. The resilience of the asset class out of 2008 was very high. It's just not as risky as equities. I think credit has become a whipping boy for people that had a bad experience in 2008. I don't think it's deserved at all. Another area, I would say, is where people invest from a geographic perspective. Domestically, people have tended to over-invest in Australia, not that there's anything wrong with that, it's just there's huge diversification benefits by investing outside of Australia. I think people overestimate the liquidity that's available in the Australian credit market and they overestimate the returns that you can get from Australian credit, relative to global credit. I just don't think that Australia gives you the same opportunity set as investing offshore. So I think that's another big myth. Another myth is that just a handful of securities can make up the credit investment in your portfolio. To make a portfolio of credit, you need a lot more names than you need to make a portfolio of equities. The whole portfolio theory around investing in credit is that it's diversifiable risk. You should be taking advantage of that, and get diversified, but people get hypnotised by single names that promise an overly attractive yield. In some ways, in Australia, you see investors invest in the same risk, and Australian risk can be quite correlated. For example some will invest in Aussie bank shares, and they'll also invest in bank hybrid securities. It's a very similar risk, and they'll also have an investment property as well. If you add those together, it's very correlated to Australia. Finally, the Yanks are raising rates and that’s going to raise rates everywhere else, including Australia. American home owners are less sensitive to rising rates because their mortgages are fixed. Australian mortgages generally float, so that’s another domestic risk factor. I get concerned about that. Visit the Bentham website to access some educational articles on investing in credit markets.